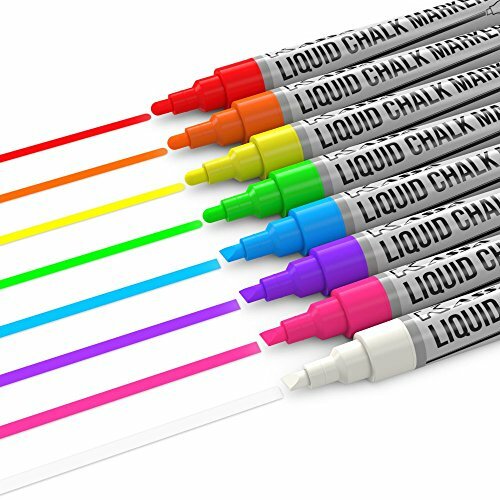 The Kassa Liquid Chalk Markers are the ideal tool for drawing or writing on chalkboards, glass, windows, and almost any imaginable surface. These markers are fast-dry and easily erasable (for non-porous surfaces). Eight different bright and funky colors are included in every package (White, Orange, Purple, Pink, Green, Blue, Yellow, or Red). Glass markers and window markers. Work on: In addition to paper; non-porous surfaces (chalkboards), glass, windows, varnished woods, chalkboard contact paper (chalkboard vinyl), appliances, whiteboards, LED boards, counter-tops, stainless steel, glazed ceramic tile, wine glasses, champagne glasses, bistro boards and more!